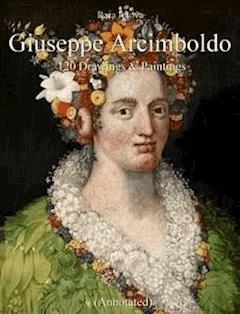 This book with introduction and annotations written by Raia Iotova contains reproductions of drawings and paintings by Giuseppe Arcimboldo. Giuseppe Arcimboldo (1526 - 1593) was notorious mainly for his "combined portraits", parody images executed by mixing, in a kind of “optical illusion”, items or parts of the same group, for instance vegetables and fruits, fishes, different kinds of birds, symbolically connected to the embodied focus, in order as to synthesize the new image itself. The artist obliged his prominence to the surprising portrait images of fruits, animals and flowers, but as well non-living items, which he cleverly assembled so that they merge with the assist of the fantasy of the observer to the look of a human face. These associative images frequently proved to his contemporaries with the portrayed individuals. He establishes himself with this idea as a important painter of Mannerism in late Renaissance. The representative painters of his epoch had completed a superior excellence and synchronization in the imitation of natural world. Mannerism presented a counter-suggestion or a modern development of potential at his era. The modern painters liked Giuseppe Arcimboldo, who was bright individualist, funded his painting on personal inspirations or extraordinary ideas that went further than the traditional-harmonic image. The symbolic or mysterious (unknowable, confusing) representation became a fundamental stylistic component of Mannerism.